Fortune magazine writer Andrew Blum and graphic designer Nicholas Rapp teamed up with the telecommunications data and infrastructure company GeoTel Communications to map the physical infrastructure of the Internet. 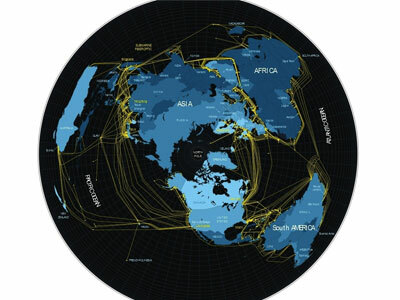 These visuals depict where the fiber-optic cables run to connect the various corners of the globe; usually underwater to and from power repeaters in major cities. From there, the Internet signals join metropolitan connected grids. 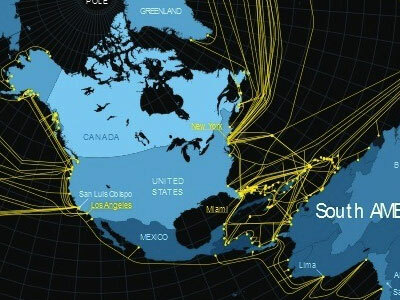 This location information is free to all under the Freedom of Information Act, though key structural elements such as bridges and tunnels, as well as locations of data centers near Wall Street, have been excluded from the graphic.